She lifts a hand towards the bundle, but lets it drop again. Anticipation is a strange creature. For nearly two years she has waited for this moment, and now it is here, she doesn’t want to unwrap the parcel. How long has she imagined the illuminators with brush and quill, bent at their desks day after day, choosing colour and gold leaf. How long has she waited to see their work. But now she doesn’t want to look inside. When Mathilda orders a prayer book made, she imagines it as a thing of beauty, both a sacred object and a symbol of the status she and her husband will hold. But when it is delivered, almost two years later, much has changed. For the illuminators, too, life has changed. In their small shop in London, a team of five have worked on the illustrations, each with their own things to prove and their own reasons for being there. The creation of the book is as complex as their lives, and the life of the woman for whom it is intended. The Book of Colours is a complex, well woven story of life in 14th century England. Set against the backdrop of real events, and with a strong cast of characters from all walks of life, the story alternates between the events in the months after the book is delivered, and those in the time it is being worked on in London. The richness and complexity of the illuminations in the book are echoed in the rich, complex lives of the characters, particularly Will, an illuminator with a troubled past, Gemma, the wife of the master illuminator whose shop Will works in, and the Lady Mathilda, for whom the book is destined. Gemma’s husband, John, their son and other minor characters are also presented as rounded, intriguing characters. Like the precious book in the story, this is a book which will stay with the reader fora long time. In his imaginary book . . . Since Cecil was drawn, he’s been waiting to be in a book. He’s spent most of his life on a pin up board, where he’s seen other creatures come and go, pained, adorned and surrounded by words in shiny new books. Now, he’s sick of waiting. Determined to be in a book, he rips himself from the pin up board, but soon finds himself getting more adventure than he planned, in the wrong book. Luckily, after he escapes, he realises there is a scrapbook full of ideas waiting for him. I Want to Be in a Book is a delightful meta-fiction offering from the late Narelle Oliver. With a mix of illustration techniques including Cecil sketched on lined paper, collage, photography and digital techniques and the text ‘typed’ on note paper, the story is visually pleasing with lots to see and find. Cecil is a delight and a wonderful reminder of Oliver’s talents. with platters of ants and buttered bread. trying not fall in the billabong. All the animals love reading, and are members of the Bush Book Club. Everyone, that is, except Bilby. Bilby has never found a book that interest him. he is too busy twiddling and fiddling, skipping and hopping. Until one day he finds himself alone with nothing but a room full of books. The Bush Book Club is a lovely story about books – and the importance of finding the right one. The resolution makes clear the premise held by many teachers, librarians, authors and other book people that there is a right book for every reader, and that a child who doesn’t like books hasn’t been given the right book yet. 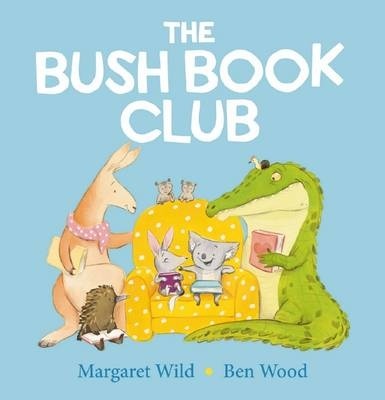 Bilby and his friends have been beautifully brought to life in the water colour and pencil illustrations by Ben Wood, and youngsters will also enjoy the settings, especially the tree-home of the Book Club. boredom can be very big. Books are good for covering up accidents with jam. This small format hardcover is made to be treasured. The text is sparse – a few sentences per page, with illustrations, by Sarah Wilkins, filled with as much whimsy as the text – a child reading whilst riding a bike, an acrobat sharing a book from his trapeze and more. Book lovers young and old will smile, and want to share out loud, and the book could be used as a conversation starter in the classroom or at book groups. A lovely gift idea for the bookaholic in your life. The day my dad said Mister Mosely was ‘just a dog’, my mum punched him. Not a punch like the one Dad gave Uncle Gavin that that time when Uncle Gavin’s tooth came out and there was all the blood and everything. But not a girl punch or a mucking-around punch either/ Mum really meant it. You could tell by the way she scrunched her face right up and made her eyes go small. Misster Mosely is special. He doesn’t have a pedigree, but he is just the right dog for Corey and his family and, from the time Corey chooses him from a litter of his Uncle Gavin’s dog’s puppies, he becomes part of the family. He is loyal and funny and, from time to time, downright silly. Every member of the family – Mum, Dad, Corey, his little sister Amelia and even new baby Grace – has a special bond with Mister Mosely. And sometimes it seems that it is Mister Mosely who holds the whole family together. Just a Dog is a delightful tale of one dog and his family. On the surface it is a collection of stories from different phases of his life, but it is also the story of a family going through the highs and lows of family life. As Corey watches his parents’ struggle, and wonders whether life will ever be the same again, he has the constant presence of Mister Mosely as a comforting force. From award-winning author Michael Gerard Bauer, Just a Dog is suitable for middle and upper primary aged readers. This book can be purchased from any good book store, or online from Fishpond. Buying through this link supports Aussiereviews. You’re in the WRONG BOOK! Nicholas Ickle has a problem. He is trying to tell a story – but his book is repeatedly crashed by characters who don’t belong. First, it’s an elephant, then two monsters, a pirate, a queen and her attendants and more. As the intruders get increasingly ridiculous, Nicholas gets increasingly frustrated – only getting the chance to tell the reader what the book is supposed to be about as a giant ‘The End’ drops from above. This funny picture book is a wonderful read aloud offering. Not only will adults enjoy reading it, but children will quickly join in on the refrain of ‘You’re in the wrong book!’ The illustrations are large and comic, with Nicholas Ickle dressed as a ring master, in dress-ups including a coat with tails, a top hat with sticky tape visible, and shorts. The intruders range from the big, slightly puzzled looking elephant which takes up a whole page, to a pirate in a one-man boat on wheels, and a snooty looking queen. This is the sort of book which will withstand repeated reading and is sure to become a firm favourite.